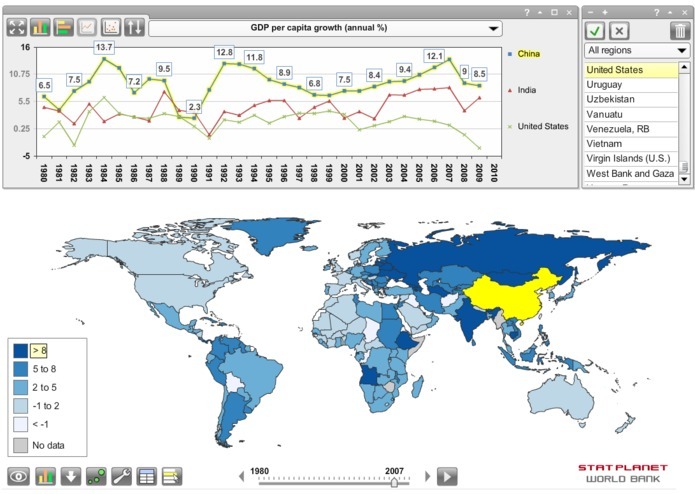 StatPlanet World Bank is an application for exploring and analyzing the 3000+ indicators available from the World Bank database through interactive maps and graphs. The application aims to provide anyone - but in particular decision makers and policy makers - with a quick and easy interface to access the World Bank data, in a format that suits their needs or interests, even when Internet connectivity is not available. To facilitate access to the data anytime and anywhere, both web and desktop application versions are available. The web version is updated real time and can retrieve indicators either by topic (e.g. “Education”) or by ‘data source’ (e.g. “African Development Indicators”). It is available in English, French and Spanish. In order to function without Internet connectivity, the desktop version comes with a pre-defined selection of World Bank data, as well as relevant data from other sources related to the MDGs. This is currently in English only, but the database can be freely modified and expanded by others. To get started, select an indicator from the drop-down menu in the top of the application. By default, the interface displays an interactive map as well as a time series graph. The interactive map displays data for all countries for the current indicator. The time series graph only displays selected countries. Countries can be selected by clicking on them in the map or in the country selection panel next to the graph. The data can also be viewed as a bar chart by clicking the corresponding icon above the graph. 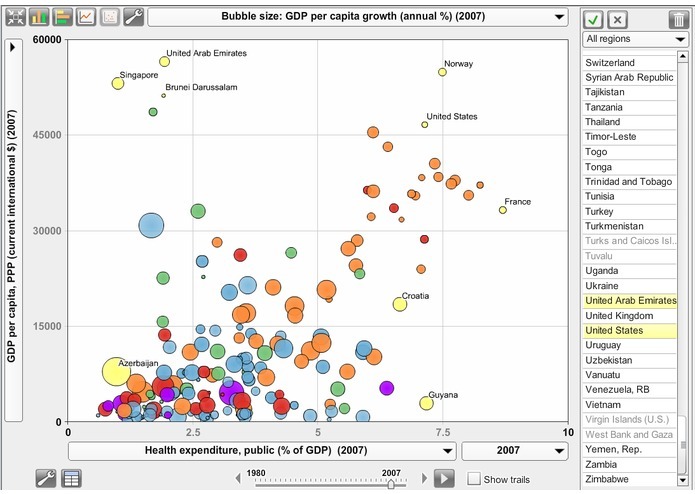 To compare two or three indicators, select the scatter plot icon: different indicators can be selected for the x-axis, y-axis as well as for the bubble size through corresponding drop-down menus. Changes over time can be animated through the time slider in the bottom of the screen - this can be activated by pressing the “play” button. This animates both the map as well as the bar chart or scatter plot (depending on which one is selected). To focus on a particular sub-set of countries, select a region (e.g. Sub-Saharan Africa) from the drop down menu in the panel in the top-right corner, or create your own country sub-set through the selection options in this panel. More options are available through the icons in the bottom-left corner - such as the option to save the current map or graph as an image (only available in the web version). StatPlanet World Bank is built on top of the existing StatPlanet platform, which is available through the SACMEQ website (Southern and Eastern Africa Consortium for Monitoring Educational Quality).